A man from Selsey has been arrested on suspicion of the attempted murder of a 28-year-old woman, police have said. The arrest was made following a separate incident, where the woman was reportedly hit by a car as she lay in a road near Chichester at 5.15pm on Monday, January 18. According to police, the 28-year-old woman suffered serious multiple injuries and was taken to the Royal Sussex County Hospital, Brighton, where she is a serious but stable condition. 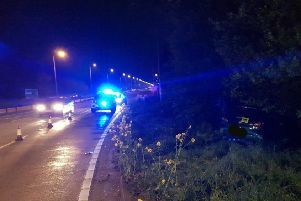 The driver of the Ford Ka involved, a 52-year-old man from Poole, was uninjured in the collision, which happened on the B2110 Selsey Road, near the junction of St George’s Drive, Donnington. The road remained closed for several hours. “The circumstances are under investigation and a 56-year-old Selsey man has been arrested on suspicion of attempted murder and is currently in custody. He is known to the victim,” Sussex Police said in a statement. Police are appealing for witnesses to the collision or anyone who may have seen the woman in the area before the incident. Contact police by emailing collision.appeal@sussex.pnn.police.uk or ring 101 quoting Operation Haydock.